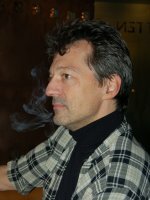 Bart (b. June 18th, 1959) was the initiator of Russulales News, a journal published between 1991 and 1996 at irregular intervals. Bart obtained his Ph.D in 1989 at the University of Gent, Belgium, with a revision of Russula in Africa for which he received the Augustin Pyramus de Candolle price of the Academy of Natural Sciences in Geneva, Switzerland. The descriptive part was published in the Flore Illustrée des Champignons d'Afrique centrale by the National Botanical Garden of Belgium (1993-97). After his Ph.D, he has been continuing his research in tropical Mycology, first with G.L. Hennebert at the University of Louvain-la-neuve, Belgium, and later at the University of Bujumbura in Burundi, Central Africa. Since 1996, Bart joined the Laboratoire de Cryptogamie of the National History Museum in Paris, where he is also responsible for the Mycology Herbarium. Since 1984, Bart has been collecting edible and ectomycorrhizal mushrooms in many Central and East African countries. Since his appointment in Paris, he has an active collecting program in Madagascar, but is interested in Russula worldwide and is studying collections of colleagues from many continents. Together with Vincent Robert, presently at CBS in Delft (NL)., he developed ALLRUS, a software program allowing identification and classification of worldwide Russula, for which he is preparing a new version. When he is not working, he is with his wife and 2 sons in Belgium, spending most of his time in the kitchen, preparing lunch or dinner to be served with a nice bottle of wine, or taking care of the garden. Adamcík, S. & Buyck, B. (2014) – Type studies in Russula subsection Nigricantes from the Eastern United States. Cryptog. Mycol. [IPNI] 35 (3): 293-309. Adamcík, S., Carteret, X. & Buyck, B. (2013) – Type studies on some Russula species described by C.H. Peck. Cryptog. Mycol. [IPNI] 34 (4): 367-391. Buyck, B. & Adamcík, S. (2013) – Type studies in Russula subsection Lactarioideae from North America and a tentative key to North American species. Cryptog. Mycol. [IPNI] 34 (3): 259-279. Das, K., Atri, N.S. & Buyck, B. (2013) – Three new species of Russula (Russulales) from India. Mycosphere 4 (4): 722-732. Buyck, B., Bessette, A. & Adamcík, S. (2011) – Russula hixsonii Murrill, a rare and intriguing Southern species of uncertain systematic position, rediscovered in Georgia, USA. Cryptog. Mycol. [IPNI] 32 (4): 403-412. Last update: 27/12/2010 - 1488792 visits (4032052 pages) since 09/01/2004.